I did some rough edits by myself, since the editor didn’t come online. It’s 4AM… T_T I just can’t afford to wait that long. Gongson Chun Gi stared up at the sky, and muttered. After saying that, Gongson Chun Gi began to walk amongst the silver slivers of water mindlessly. Not even the rain from the sky could wet him. There was an invisible shell that surrounded his entire body. A person that surpassed human limits. That was the pope of the Heavenly Demon Church, Gongson Chun Gi. Gyum couldn’t really believe the pope’s words, but who was he to disobey? Lim Hak Gyum hid himself behind a pillar, and stationed himself there. Then, Gongson Chun Gi massaged his shoulders and spoke. After complaining in a small voice, Gongson Chun Gi opened the door and entered. Looking at all this from the back, Lim Hak Gyum smiled. His holiness always looked outgoing and relaxed. But it seemed that when it came to mental stress people had with disciples, he was the same as everyone. This was something unfamiliar, but it was something good to see. Lim Hak Gyum always looked at Gongson Chun Gi with reverence and respect. Cho Ryu Hyang was getting confused, because the pope agreed to this too quickly. The Pope had an unflustered reaction. Cho Ryu Hyang put away all the plans he had in mind to persuade the pope, and stayed quiet for a while. Soon, he asked a question. Gongson Chun Gi smirked at Cho Ryu Hyang’s question. Cho Ryu Hyang didn’t react to Gongson Chun Gi’s joke, and kept a straight face. That was because he couldn’t really understand this whole situation. The Pope looked like he would agree to any condition as long as Cho Ryu Hyang became his disciple. No, something like that did indeed happen. The love a parent shows to their child. Cho Ryu Hyang believed that nothing in the world was free, other than that. Gongson Chun Gi stopped there. He then spoke with a serious face. The Pope of the Heavenly Demon Church. This was a chance to become the heir to the church. It would be a lie if Cho Ryu Hyang said he wasn’t tempted to become the heir. Cho Ryu Hyang looked at Gongson Chun Gi. Unlike what he had said earlier, Gongson Chun Gi’s eyes looked quite shaken. The man was regretting what he said just now quite a lot, it seemed. Cho Ryu Hyang smiled when he saw that. Cho Ryu Hyang stared at the complaining man in front of him. He didn’t know if the Pope was acting all this out or not, but the Pope’s reactions still eased his mind a little. Wasn’t the hope thinking too highly of Cho Ryu Hyang? The boy made an embarrassed face when a compliment came at him. The strongest man under the heavens. And the living god of the Heavenly Demon Church. The rumors in the martial world hinted that the Pope was actually a being that resided in the heavens. It was an extremely shameless and a brazen statement, but strangely, it didn’t seem that out of place when the Pope said it. While Cho Ryu Hyang showed a bit of a dumb face because of the previous statement. Gongson Chun Gi grabbed onto Cho Ryu Hyang’s shoulders, and spoke. Did the Pope want to say that? Cho Ryu Hyang smiled, and nodded. When Gongson Chun Gi saw that, he made a serious face and spoke. Cho Ryu Hyang, at that moment, had to redetermine his impression of the Pope. The Pope wasn’t just a shameless person. He was prideful and ambitious, which was what made him say that. Cho Ryu Hyang felt something right then. It was a feeling that implied that perhaps he might actually come to respect the person in front of him someday. Cho Ryu Hyang stared into Gongson Chun Gi’s eyes, and spoke. After hearing that, the stiff face of the Pope turned into a grin. Gongson Chun Gi pat the boy’s back, and spoke. Be treated accordingly? What did that exactly mean? When Cho Ryu Hyang made a curious face, Gongson Chun Gi grinned. It took Cho Ryu Hyang less than an hour till he understood what the Pope meant. Gongson Chun Gi looked at the figure outside the door, and smirked. That was because Guardian Ju was standing next to Lim Hak Gyum with an anxious face. Guardian Ju rushed out the moment Gongson Chun Gi walked out the door. Leaving Guardian Ju, who had an ecstatic expression on his face, behind, Gongson Chun Gi began thinking about something else entirely. What should he teach his disciple? It seemed that the boy didn’t know a single thing about martial arts……. Gongson Chun Gi began to list out all the martial arts that he knew in his brain. Guardian Ju came to his senses at that point. After looking at the cabin next to him for a moment, he slipped away. He had to be somewhere else. The door opened, and Um Seung Do walked in respectfully. The moment he saw Cho Ryu Hyang, he dropped down onto his knees. When Cho Ryu Hyang widened his eyes in surprise, Um Seung Do spoke. Rumors spread fast, it seemed. When Cho Ryu Hyang thought that, Um Seung Do bowed down to Cho Ryu Hyang. How should he respond to this? While Cho Ryu Hyang was acting a bit troubled over this, Um Seung Do began to talk with a determined face. Cho Ryu Hyang slowly opened his mouth when he saw that Um Seung Do was actually prepared to take his own life. Was this the so-called way of the martial artists? It was true that Cho Ryu Hyang didn’t really know what he should do when he looked at Um Sung Do. He thought that he would just have to get used to it, but it seemed that that wouldn’t really work out. What should he do, then? Honestly, he didn’t really have to think of anything. There was an easy solution to all this. Cho Ryu Hyang sighed, and opened his mouth. Um Seung Do didn’t even twitch. Just what did he not like? When Cho Ryu Hyang was about to ask that question, Um Seung Do spoke. Cho Ryu Hyang closed his mouth. When he heard Um Seung Do’s words, he realized just what kind of a choice he had made a while ago. The heir to the church. It was one of the biggest positions one could get in the martial world. Cho Ryu Hyang, who was in a dazed state for a brief moment, looked at Um Seung Do, who was still bowing at him, with a complicated face. He slowly opened his mouth. To think commanding someone would be this awkward. Um Seung Do stood up with frightening speed. And spoke. Um Seung Do lightly bowed with a polite expression. After that, he opened his mouth to say something. Cho Ryu Hyang felt a bit suspicious, but he still stood up. When Cho Ryu Hyang followed Um Seung Do, he was able to see an auditorium far away. For some strange reason, his heart was beating quite loudly. It felt like something big was about to happen. Cho Ryu Hyang entered the auditorium with a strange feeling. There, he saw. He saw the reason why everyone in the world feared the Heavenly Demon Church. A part of that reason was awaiting him. It was a giant auditorium. However, the whole place was packed. A total of 5000 people. Everyone in the Gansu branch of the church was waiting here silently. A breathtaking feeling of solitude. Cho Ryu Hyang walked up to the pedestal, guided by Um Seung Do. While Cho Ryu Hyang was looking at these people with a dumb face, Um Seung Do came up next to Cho Ryu Hyang and looked at the people down below. He then gathered energy from the pit of his stomach, and shouted. The moment Um Seung Do’s roar rang across the auditorium, the people in the auditorium all simultaneously put their feet together, and knelt down. A vibration, resembling that of an earthquake, shook the auditorium. After that, they all paused a bit, then shouted. A shout that made his hair tremble. 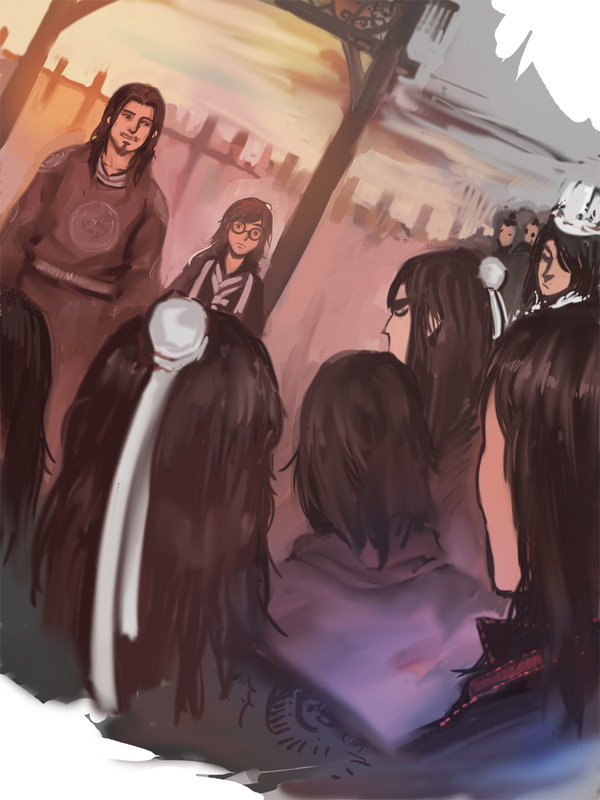 It was his first time seeing this many people gathered in one place, and the aura exuded by each of them was really no joke. It was absolutely breathtaking. It wasn’t a bad feeling. He was surprised by how excited he felt when he stood in front of all these people. A pool of spit gathered in his mouth, and his body started to get hot. This whole thing was an experience that he couldn’t really put to words. Two old men, one wrinkly, and one big, could be seen next to him. When Cho Ryu Hyang looked at them, the wrinkly old man introduced himself. Since he didn’t know the manners of the church yet, it was kind of awkward for him to speak. Guardian Ju stepped back, as if he realized that. When Cho Ryu Hyang turned his head, he could see Gongson Chun Gi approaching him with a smile. How could he not be surprised? Gongson Chun Gi pat Cho Ryu Hyang’s hair a bit, and stood on the center of the pedestal as if this was the most natural thing he could do in the world. Once he stood in the center, everything went quiet. After taking in the silence a bit, Gongson Chun Gi looked at the 5000 martial artists standing there in rows. He slowly opened his mouth. A tiny whisper. But there wasn’t anyone in the auditorium, who was unable to hear these words. After saying that, he put Cho Ryu Hyang, who still had a shocked look on his face, in front of him. The whole area was engulfed with shouts. This was the first meeting between Cho Ryu Hyang, who would be known as King Shura in the future, and the Heavenly Demon Church, which would be known as the Absolute Religion (絶代神敎). thanks. this is damm exciting! Wow. That was quite a chapter, jeez this is up there with LMS and Sword of the emperor as great Korean novels as far as i’m concerned. Thank you so much for not waiting!!! and for all your hard work!!!! I love this with unholy love!!! Yeah. There are a lot going on here. This really is where the story starts to move faster. I’m being a captain obvious here, but you know what, I don’t give a flying f***. I swear too much. Uhm… mind if i ask… what does “Shura” mean? Asura. In Korea, people can either call it Asura, or Shura. This is one of the most awesome novels I’ve ever read…….. looking forward to future chapters… I hope they will be just as awesome…. Thanks for the translation. Really liking the work thus far. Slight fix: “A heir” -> “An heir”, a/an is decided not by the first *letter* of the following word being a vowel or not, but by the first *sound* in the following word. Hence, ‘an unknown’ and ‘a unicorn’, as the latter is pronounced with a ‘yu’ sound.